A recent outfit with the Bardot Chanel inspired two-tone tights that I was obsessing over a few months ago. Sorry for being slack with the sewing DIY's! I really do want to post some soon, I've just been so busy sewing the Miu Miu inspired skirts. Oh and to celebrate 100 posts on Le blog de Sushi, I'll be holding a great giveaway kindly sponsored by chickdowntown.com. So check back soon! I have those tights. They look cute on you! Such a cute look! love the neck tie :) congrats on your 100th post! I totally love it and you could pull it off. ooh, absolutely gorgeous tights!! I love the detailed pattern on them! I have those tights too! I love the outfit, Sushi!! You're such an inspiration! I emailed you a few weeks ago re the Miu Miu inspired skirts. Would a no reply indicate that you are not taking orders at the moment? Love it! 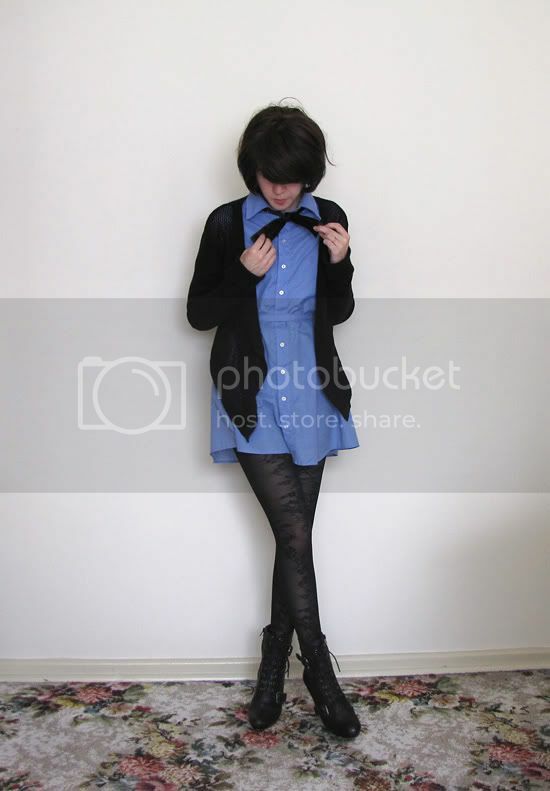 Those tights are fantastic and the neck tie tops off the whole outfit perfectly! 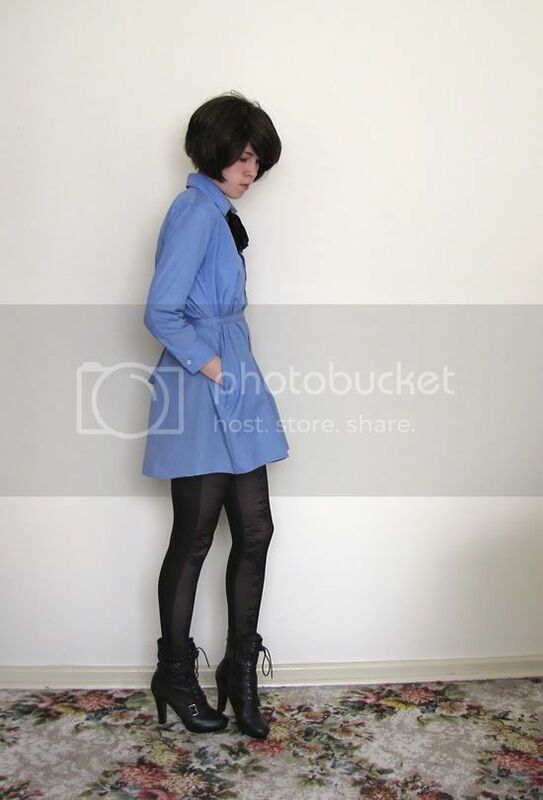 Btw that dress and that pair of tights are lovely! gorgeous tights. & such a sweet outfit too. Wow I LOVE those tights sushi!!!! How long ago did you buy them?? Do you think they have any left?? 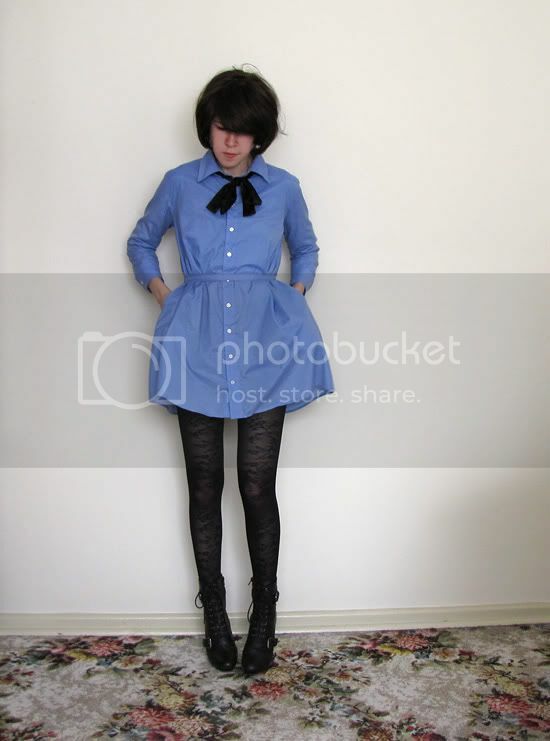 omg so cute, i want the shirtdress! Love the necktie.. it totally makes the outfit! the boots are so cute . those tights are so rad! wow! :) love the first pic! Your outfit is just adoooorable!! I love this look on you! You look so classy and cute!! i need a pair of those tights! 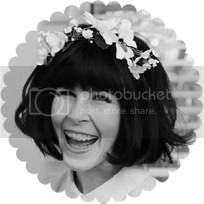 did i miss something on the blogosphere, were did you get them? do tell! holla. awesome look and great blog! I will follow you! I think the necktie adds the perfect touch! And that shirt dress looks awesome on you. Your boots are amazing. Love this outfit! I think you're very inspiring! Cute! AA makes the perfect shirt dress. Love the whole outfit! I never go into Bardot so this is obviously my punishment! I would love some of those tights! And the dress is perfection, I need one! I adore the outfit and your carpet!